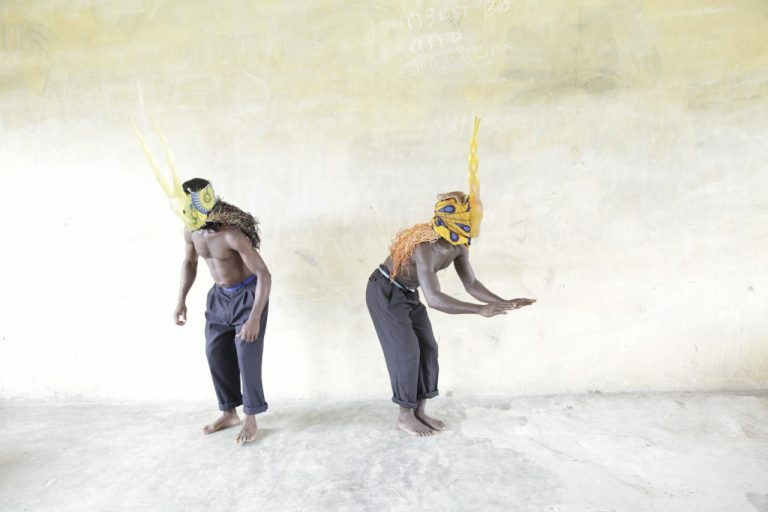 Karikpo: Holy Star Boyz is a continuation of Zina Saro-Wiwa’s exploration into the world of masquerade in the Niger Delta, specifically the antelope-inspired Karikpo masquerade that is unique to the Ogoni people. In this series, Saro-Wiwa has reinvented the mask and used them as motifs to explore a range of personal emotions and socio-political questions. 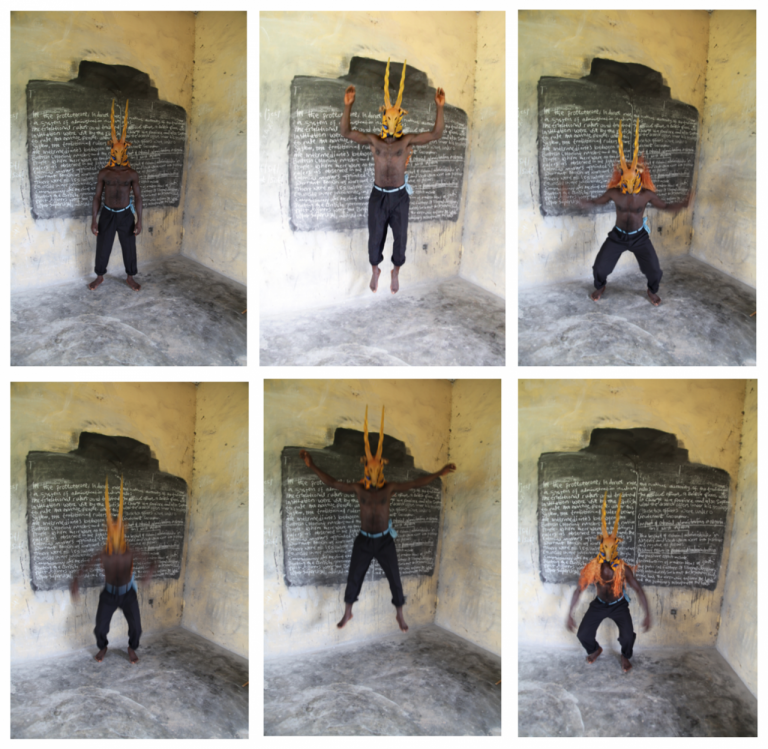 Her first work Karikpo Pipeline – a five-channel video – transposed the boyish, athletic and acrobatic performance of the masquerade onto remnants of the oil industry dotted around the Ogoniland landscape. This new series of lightbox works express the ways the industry has impacted and transformed social performances and is a meditation on hybridity, alienation, education and diaspora. Although the masks themselves are cast from an actual traditional karikpo mask, these new breeds are made of a petroleum-based resin. And whilst they appear translucent they are far heavier than their wooden predecessor and do not allow for the acrobatic performance that is traditional for Karikpo dancers. 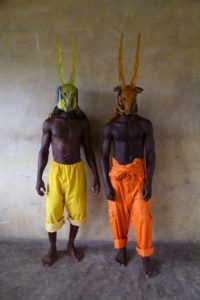 The color of the masks reference the colors worn by industrial labourers and penal dwellers in the Niger Delta and around the world. 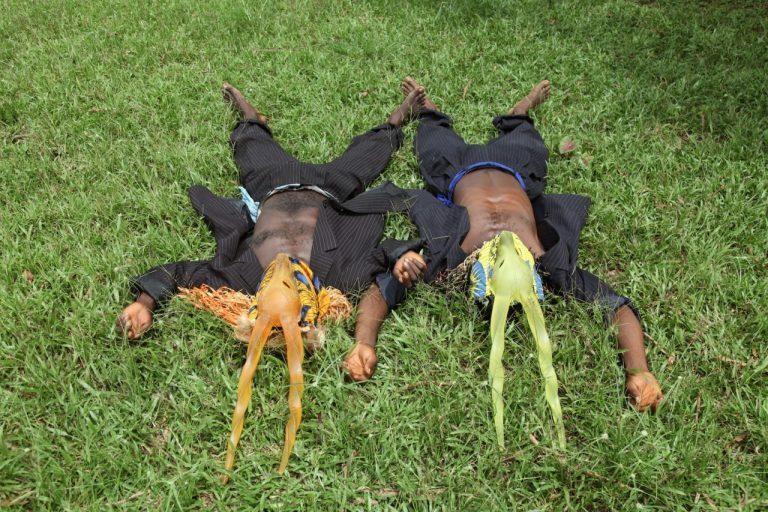 Zina Saro-Wiwa is an artist working primarily with video but also photography, sculpture, sound and food. She lives and works in Brooklyn, New York as well as running a practise in the Niger Delta region of Nigeria where she founded the contemporary art gallery Boys’ Quarters Project Space for which she regularly curates. Saro-Wiwa is one of Foreign Policy Magazine’s Global Thinkers of 2016 recognized for her work in the Niger Delta. She was Artist-in-Residence at Pratt Institute, Brooklyn 2016-2017 and in April 2017 was awarded a Guggenheim Fellowship for Fine Arts. Saro-Wiwa’s interest lies in mapping emotional landscapes. She often explores highly personal experiences, carefully recording their choreography, making tangible the space between internal experience and outward performance as well as bringing cross-cultural and environmental/geographic considerations to bear on these articulations. The slippery dynamics between “truth”, “reality” and “performance” lie at the heart of her video performance work. The very idea of landscape and environment is constantly being interrogated in her video work, in the exhibitions she curates at Boys’ Quarters in Nigeria as well as in her work with food. Saro-Wiwa’s first foray into the art world was in 2008 when her documentary This Is My Africa was shown at Stevenson Gallery in Cape Town. The film went on to be shown on HBO as well as film festivals and museums and galleries. In 2010 her career as an artist began in earnest in New York, when she was invited to curate her first ever contemporary art exhibition at SoHo’s, now disbanded, Location One Gallery. The group show – titled Sharon Stone in Abuja – was one that explored the narrative and visual conventions of the Nollywood film industry. In addition to curating the show, Saro-Wiwa created and contributed her first-ever installation pieces and experimental alt-Nollywood films. Since her New York debut she has been commissioned by the Menil Collection and Seattle Art Museum, has had work shown at the Pulitzer Foundation, Moderna Museet in Stockholm, Stevenson Gallery, Goodman Gallery, Nikolaj Kunsthal, Tate Britain, Fowler Museum in LA, the Brooklyn Museum and many other institutions. Her first ever solo museum show Did You Know We Taught Them How To Dance? went up at Blaffer Art Museum in Houston in 2015 and opened at Krannert Art Museum in Illinois in November 2016. Her recently published monograph for the show also titled Did You Know We Taught Them How To Dance? – published by Washington Press – is available at the Brooklyn Museum book store and Amazon.com.